Why is this important? Most advertisers (and your competition) commonly use sight, sound and touch to create an integrated brand experience, but few use smell. This is an opportunity for your company to be at the forefront of aromatic branding. Click here to go to our online catalog of aromatic promotional products. At Flat World Design, we can help you make your customers associate a pleasing and memorable aroma with your brand. Moreover, we would also suggest that you follow the advice of Dr Eric Spangenberg, Dean of the College of Business and Economics at Washington State University, who ran a test in a clothing store in the Pacific Northwest of the US to determine how scent affected customers by gender. In his book, Brand Sense, Martin Lindstrom reveals that a full seventy-five percent of the emotions we generate on a daily basis are affected by smell…Next to sight, it’s the most important sense we have. These results come from a research study by Millward Brown, one of the largest research institutions in the world. If you are looking for unique, and more importantly, cost-effective ways to promote your brand, company, or product, contact us today via email or phone and we’ll work with you to help achieve your promotional marketing objectives. Marketing with scents stimulate powerful memories to a brand. Gently glides into auto air vent as a non-obtrusive air freshener. Colorfully displays logo in a place to be seen daily. Odor eliminating technology helps neutralize odors while the air freshener releases a refreshingly pleasant scent. Lower minimums; can assort scents in increments of 50; faster lead time; lower cost! Individually packaged in a clear tube with an instructional label. 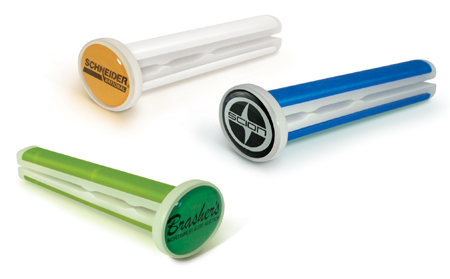 Ideal for a tradeshow promotion or giveaway.